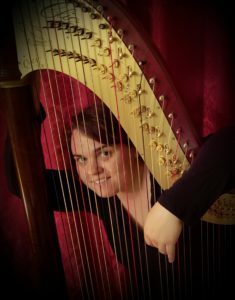 On Friday, February 22, 2019 at 8:00 p.m., Concerts at Saint Mary will present harpist and composer Emily Mason as she performs an evening of music for harp. Ms. Mason will also be joined by internationally-acclaimed Philippine-born American tenor Allan Palacios Chan and organist David Uschold. Originally from southern Virginia, Emily Mason now, for over eight years, calls District of Columbia area her home where she has an active career as a harpist, classical/jazz pianist, mezzo-soprano and organist. She has been heard in venues such as the World Health Organization, the Ronald Reagan Building and International Trade Center, Saint Thomas More Cathedral in Arlington, Virginia, and events for the Library of Congress. In addition, she occasionally joins the Manassas Symphony Orchestra. Known for her original transcriptions of orchestral, piano and ensemble music for harp, she enjoys playing music which is unusual to hear on the harp – jazz, pop, and even classic rock. Ms. Mason is currently Director of Music at St. Veronica Church in Chantilly, Virginia. The concert program which will be presented by Ms. Mason will include performances of a variety of repertoire from classical to secular and will feature two original transcriptions: Movement No. 2(“The Lyre of Orpheus”) from the fourth piano concerto by Ludwig van Beethoven arranged for harp and organ; and Love Bade Me Welcomefrom Five Mystical Songsby Ralph Vaughan William arranged for tenor, harp and organ. Admission to the concert is free and a free-will offering will be taken to support future Concerts at Saint Mary productions. Following the concert there will be a reception in the church’s Parish Life Center where there will be an opportunity to meet the artists and share fellowship with others.